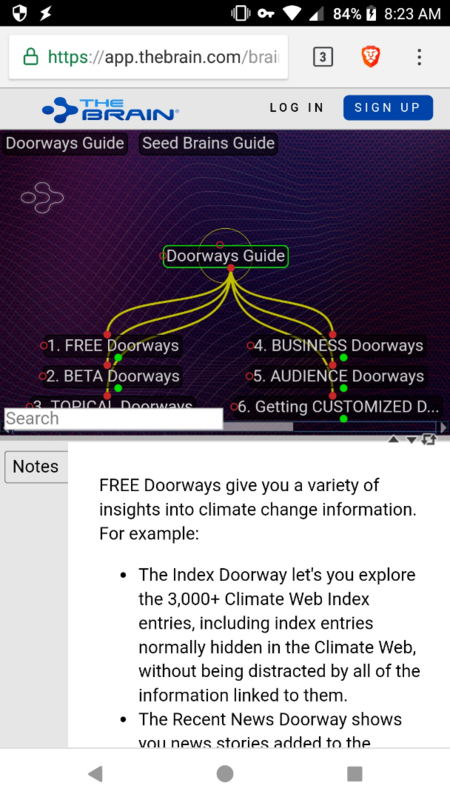 We use a TB9 brain in an iframe: https://www.theclimateweb.com/doorways-guide/ Right now when going to that page on a mobile device the embedded TB does very strange things - we're not sure why and are seeing if we can improve. Here's the question: For someone with a mobile device, what is the simplest pathway to accessing the content of that iframe, especially if doing so on a repeat basis. I'm very confused as to the answer. Note that the TB9 frame that is in the iframe is publically accessible here: https://bra.in/9qaamq. 4. As an alternative to #3 above, what if I told people to download the TB App, and then login with a specified login and password, for which account I've already made the content downloadable. They would then easily be able to download the content in the original iframe. To download other content they would need to create their own TB account. Thoughts and advice on the above? Thanks in advance! Re: Option #4 -- FWIW, we were recently told that multiple people cannot use one brain account. If this is still the case, then item #4 would not be an option. -- You also probably wouldn't want a growing number of users to have access to one account where they all could (theoretically) start creating and editing brains willy nilly. Re: Option #3 -- At this point, downloading a v9 brain and/or accessing it through the email distribution is the ONLY way brains can now be shared privately since TB9 embeds no longer provide the option for disabling public sharing. In light of this, I would be extremely interested to know if anyone using TB9 has offered users the option of downloading a v9 brain (either free or for a fee) -- and, if so, if any users have taken them up on this offer. I, too, thought it would be unlikely that many of our brain/site visitors will be interested in this option -- but since it is the only option for private sharing available to us now, I'll be interested to know if anyone has had any success sharing brains this way. Thanks Metta. Re Option#4 - my perception is that the situation I'm discussing is fundamentally different than the situation being discussed in that prior thread. In that case TB was trying to make sure multiple people aren't using the same license to collaborate on a brain while avoiding paying a license fee. In this case we're simply talking about how people can use the free iOS app to view a brain created by a legitimate license holder (no collaboration of any sort). I guess in theory people could create brains with that login info, but they could do exactly the same thing if they'd created their own free account for the free iOS app (and anyone could delete those brains, etc). The idea of creating brains on your mobile device strikes me as far-fetched. Re your discussion of Option 3 - I'm not worried about sharing stuff publicly or privately. I'm simply trying to figure out how people can see a TB9 Brain on a mobile device. I don't think it's possible via browser. It's only possible via app, which in turn means (I think) that everyone would have to ask me to add them to the distribution list - which is a total non-starter. If there is another way for people to view content on mobile devices, what is it? Will be interested to see if TheBrain staff are ok with your option #4. Since I'm not using the mobile apps, I'm not sure how free shared app access would differ from from free shared web access. Re: Option #3 -- I understand your concern is mobile access, and I didn't mean to distract from that with my Q about TB9 downloads. I was just following up on your assertion that email distribution would be a "nightmare" and "no one will do it" -- and I was simply wondering if anyone else had, in fact, had a more positive experience with this email sharing option -- in the same spirit as you asking if anyone disagreed. That's all. I too am very interested in your question actually. Is anyone really trying to solicit TB9 iOS downloads of their brains? Is it working? Please post!!! 1. As far as I can tell trying to access the Brain on a mobile device simply through the link just listed doesn't give you anything useful. You can sort of see the brain, you can sort of access it, but it's a mess. Also, it looks like your website may not be formatted for mobile (screenshot 1). 2. The only alternative I can think of is the TB app. 3. But is the TB app only relevant if the brain in question is downloadable, as opposed to simply being public? I'm happy to have people download the brain, but that seems to require adding their emails individually to the distribution list. That is a nightmare, and no one will do it. This is exactly what you would need to do for them to view your shared Brain within any of the apps: mobile, web, or desktop. The only other option for viewing is to make that Brain public and give (or link) the URL. To put it simply: it is one person per license. Sharing accounts, whether free or paid, is against our terms & conditions. For the mobile or desktop apps to view Brains, a local copy must be downloaded. (This copy can not be edited unless that user is a member of your TeamBrain and was given editor or admin access.) This downloaded copy is a read-only copy, and can not be edited or exported. Update: We made some changes to our new website to make it more mobile-responsive, and it has improved the way that TB9 embedded in an iframe is displaying on the page. It seems almost good, but that's probably because I know how it's supposed to work. In the Safari browser you can click around but can't see everything you need to see. And the fact that the backspace key doesn't work in TB9 is going to be extremely confusing to people. Getting people to use the iOS (and Android) apps is probably still the best way for people to experience the information - so I'm still pursuing the questions above. Sean, we were working on posts at the same. We had made a mistake on some mobile-relevant settings, so it's better now. But I'm not at all sure that people can really view a Brain via Safari (especially if it's in an iframe). I need to test what it looks like if they go right to the public link. But the lack of a back-space function by itself will confuse the #%$^ out of new users. With regard to your note re licenses, I'm fundamentally confused. Doesn't TB want people to have the best possible experience with Brains, with the goal of getting more people to buy licenses? TB is fine with people accessing Brains via a browser. And TB is fine with people downloading the free iOS app to build Brains, and then to download read-only Brains to which they've been given access rights. But TB isn't fine with giving people an easier way to accomplish that objective, purely for the purpose of having the best experience when they're not familiar with the program? I understand licenses, and I understand the purpose of licenses. In this case I can't see how the purpose of licenses is being undercut. Could someone explain the business logic of what you're saying, as opposed to simply throwing up barriers to helping people be introduced to TB in the most effective way? First, I've documented the issue of an iFrame Brain not loading properly in iOS. We'll be making some major updates to the iOS build in the very near future and making sure Brains (regardless of how they are accessed) are loading and navigating properly will be a top priority. In the mean time, as Sean has pointed out, going directly to the page on app.thebrain.com seems to be working well. Additionally, the issue of the back button when browsing in a Web Client Brain is also documented and under review. As far as the discussion of multiple people using the same log in (Climate web public account) to access your Brain via the app, this can lead to a LOT of confusion in may different ways. If your visitors already have their own Brain log in, will they want to log out/in as another user in the app? 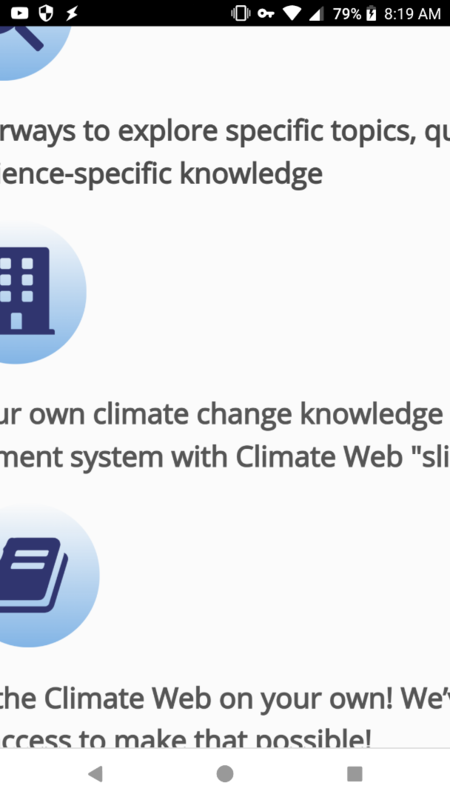 If they log in as another user on their desktop and sync... then log into Climate web in the app and don't see their Brains, will they be frustrated/confused? In general, having multiple log-ins for the same product carries it's own set of problems. Additionally, you mentioned if someone else creates a Brain with this guest account (yes, they can do that with a free account) Will other users know that it is not Climate Web related? What type of content will it have? This, again, may cause confusion and reflect poorly on all the hard work you've done. And we have no way of tracking what users created the additional Brain/s, because everyone has the same account. If MULTIPLE Brains are created... how do you/we make sure people are opening the right one when they log in? One rotten apple could spoil the bushel (as my mother would say). Then we come to the question of deleting the unwanted Brains created under this public account. Who has the right to do that? What if the user believes this is their free account to use and they create/sync a very important (to them) Brain??? I'll stop there with the worst case scenarios. In short, multiple users sharing a single account is against our license agreement. There are many reasons for this type of licensing and it's not at all just based on sales. It even protects people using the free version of the software. Hopefully these examples will give you an idea of why the #4 option described above cannot be done and we'll need to focus our efforts on making TheBrain look/work well in iFrame on iOS devices. 2. In terms of sending people on small screens directly to the brain https://bra.in/9qaamq via web client, you and Sean seem to view that as "working well." In exploring that option on my iphone I'm sort of able to navigate the Brain, but it's because I'm motivated and I know what's there. In my experience no first-time user (and few users at all) would stick around to try and navigate and use what I'm seeing on my iphone. I'm curious whether other forum users agree or disagree. But as far as I can tell, TB9 really can't be accessed via web client on an iphone. The only way to do it seems to be facilitating access via the app, which you've said is a license violation. Frustrating. If I'm missing something in terms of web client access PLEASE suggest it. 3. In terms of the backspace key (and other key web-client bugs we've discussed) it would be really helpful if TB would be transparent in terms of the problems faced. The back-space issue has been known about for a long time (a year?). Does that mean there is some fundamental problem that can't be fixed? I'm sure TB folks realize just how bizarre it is from a user perspective for a program like TB to not backspace. But if there is an unfixable problem couldn't you just tell us? +1 on fixing the back/forward navigation buttons - please! This is so long overdue, and it makes the web client so hard to navigate for new brain visitors, especially since the history rarely displays more than 2-3 thoughts at one time.